Several weeks ago, ABC made a major public spectacle of firing Roseanne Barr for posting an offensive tweet about former Obama White House Senior Advisor Valerie Jarrett. Within hours of the tweet, Barr was removed from her successful show. Of course, on the program, Barr portrayed a Trump supporting middle class woman spouting traditional American values. Her show found a huge viewing audience because it was not the usual mix of a leftist agenda with politically correct dialogue. Even though she apologized, ABC had no qualms about removing Barr, and investigating the possibility of continuing the show without Roseanne. The network did not show the same sense of outrage on Thursday when Whoopi Goldberg, the co-host of their daily talk program The View, verbally abused Fox News TV host Judge Jeanine Pirro both during and after the show. The Judge was invited on the show to promote her new book, but it soon degenerated into a shouting match with Goldberg, who became upset when Pirro accused her of having “Trump Derangement Syndrome.” Of course, the Judge’s portrayal of Goldberg was completely accurate. On a regular basis, Goldberg and her co-hosts excoriate President Trump on a variety of issues. 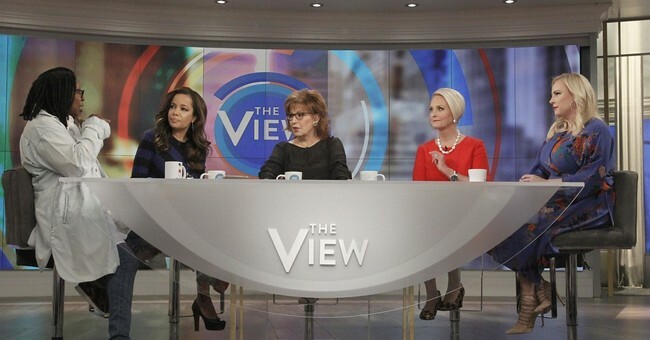 There is no ideological balance on The View, only left-wing hate. This type of rude treatment of a Trump supporter is becoming all too commonplace throughout the country. Americans have witnessed Trump supporters being harassed at restaurants, movie theaters and even denied transportation by Uber drivers. In the past, liberals used to claim they believed in the First Amendment and free speech. Their symbol used to be the peace sign, but, today, it has become the middle finger. They do not want to debate conservatives, they want to prevent conservatives from speaking. As proof, just visit any college campus today. Unfortunately, ABC, like every other broadcast network and most cable news outlets, is not fair and balanced. Instead, it is controlled by liberals who advance that ideology in all of their programming. This is the network that fired Roseanne and cancelled Last Man Standing, another show espousing conservative values, even though it was one of the highest rated programs on the network. If a conservative host had treated an Obama supporter the same way on the network, that person would have been fired. In reality, there are no conservative hosts on ABC. For example, on The View, there are five anti-Trump, mostly liberal, hosts. The interview with the Judge begins at the 02:03:15 mark. Enjoy!